This week I was working on a Spotfire project with integrated filtering and marking using relations. I’m having some issues with this functionality, and as part of my troubleshooting, I wanted to confirm all wells existed in both related tables. Lists enable me to do this quickly and easily. Read more to find out how. If you aren’t familiar with Spotfire lists and what they do, check out this Data Shop Talk post. 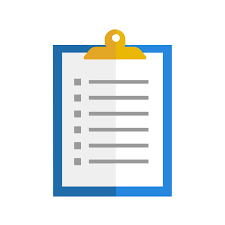 If you are familiar with lists and just want to know how to do it, read on. I have two tables with well data. The idwell column is my well identifier. As you can see, I have 166 idwells in both tables, but I want to make sure they are the same wells. 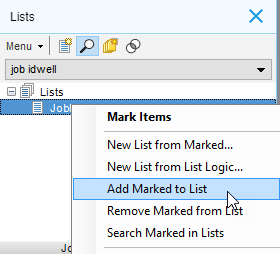 To do this, I will create two different lists of all the idwells in each table using Spotfire’s lists panel. 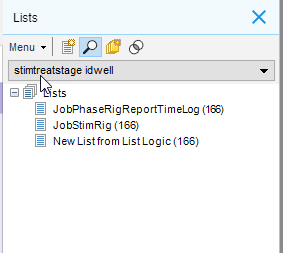 Then, I’ll create a list from list logic to tell me if the idwells in one table are the same as the other table. Here are the detailed steps. Images to support the steps are below. Add 2 table visualizations to the page and set them to the two tables being reviewed. 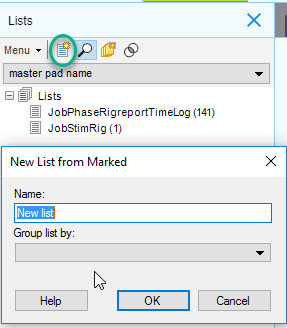 Then, click the create new list button in the list panel. Create a new list with the name of one of the tables. Repeat for the other table. Click on one of the tables to make it the active visualization. In the lists panel, select the column of data to create a list of from the drop-down at the top of the panel. Mark all of the records in one of the tables. Right-click on the corresponding list and select Add Marked to List. Repeat the process for the other table. Click on the list logic button in the lists panel. Name the new list. 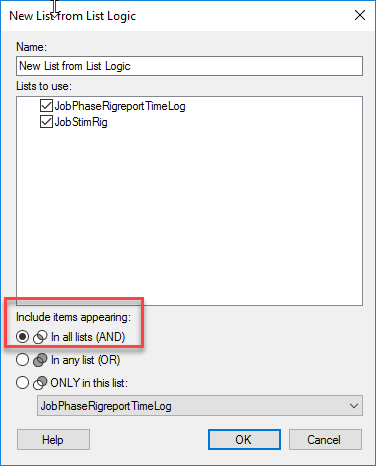 Click the checkboxes of the two lists you just created. Select the first radio button option for AND. Click OK. Select the column of data to create a list of from the drop down. Mark the table contents, right-click on the corresponding list, and add marked to list. Click the new list from list logic button. Name the new list and select (AND). The numbers in each of the lists indicate a count of unique values. In this case, it’s counting the number of idwells. Now that I have created a new list from list logic, I know the tables contain the same wells. If the list logic list contained fewer than 166 idwells, I would know the tables contained some different wells. Because the new list has the name number as the tables, I know the tables have the same idwells. Thus, I have very quickly performed a simple QAQC task that tells me both tables have the same wells. Hi Julie, good stuff. Glad to see your new business collaboration! Best of luck. The RSS feed to be added to your reader can be found here.